Francisco Rodriguez was set to make his spring training debut with the Milwaukee Brewers on Thursday, but that may not be happening anymore because he plays baseball. Pitchers are taught to point at pop-ups to help fielders locate the ball off the bat. 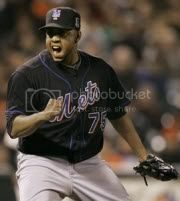 Mets closer Frankie Rodriguez is known as a hot head who isn’t afraid to show his emotion on the hill. Francisco Rodriguez was in court Wednesday to face seven counts of criminal contempt charges for violating a restraining order. The Mets hit a trifecta on Wednesday night in a way that only they can. Chalk this up as a first for Brian Bruney being mentioned here at LBS. 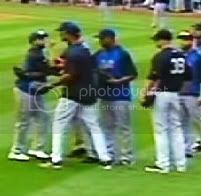 The moment Frankie Rodriguez signed with the Mets I knew things wouldn’t end well.